But what it does is first launch my standard install of Foobar that I also have on my PC, and then launch the Foobar Browser for AAD. I think the issue is that this command line assumes a standard install location for Foobar, and I've failed to find a command line option to try to point at my portable install of Foobar. can it possibly be because of my location? I'm in Russia. but I never experienced any limitations from discogs, and, again, the site itself works fine for me. I suppose it could be a location thing. I can't really test that from here, though! What I can do is offer you a debug version of discogs.boo which will create a discogs.txt file in your temp folder and open it with notepad.exe every time you do a search. It's just the raw html that discogs sends back to the script, so if you PM me a copy of that I'll see if I can figure out why the script can't parse it. I did that and I still get the same error . That could be a problem, then. I'm not sure what else to suggest, really. If you try a different WPF application (blu, for example) to see if that works then that might give some clues. I'm not very optimistic, though. The foobar browser relies on the Foobar COM Automation Server, which is very much non-portable. As far as I know, there is no way even theoretically for an external program to get access to the Foobar media library in a portable way, sorry. Still nothing unfortunately. Maybe you could release some new version that would get rid of that bug? What do you mean by 'nothing'? Did blu work or not? If blu did not work, then it is a problem some problem with your system. If blu does work, but AAD does not, then my best guess would be some configuration problem. In which case uninstalling it, making sure that the %LOCALAPPDATA%\AlbumArtDownloader folder is deleted, and reinstalling it might help. No no, I tried everything you said and it still doesn't work, sorry for not explaining. And it's quite weird 'cause few weeks ago everything was perfect and I don't have any problems with the computer. Maybe new version of the program could solve the problem? for your interest: i found another site with exceptional album art. the download store eclassical.com has mainly classical music for download. They have especially better image quality for some record companys (e.g. BIS), where other databases often result lousy scans. the picture size varies, but is mainly larger than 600px. Looks good, it's nice to have another Classical script. Please give eclassical.boo a go and let me know if you find any problems with it. wow, you're really fast. the search engine of the website has problems with "points". for example searching for "J.S. Bach" returns only one album, whereas "J. S. Bach" returns 73 results. If you take a closer look you'll realize that most of these albums are named "J.S. Bach ..." and should therefore also be found on the first search. Moreover the order of the returned items is absolutely unlogical, as the best fitting results sometimes occur at place 20+ and will not be shown in AAD unless you're setting the script to find more than 20 results. i think the results are sorted by popularity or something. but these constraints have nothing to do with your script, as they also occur with the original website. Yeah, their search engine could use some work. Not something I can fix in the script, though, I'm afraid. To test for image similarity... I put the two images to compare in two layers, then set the top layer to be "Difference" mode (or Subtract probably works just as well). That gives you what looks like just an all-black image, but to be sure I then use the Magic Wand (set to 0% tolerance) and click somewhere in the black. If there's any non-black pixels, they get highlighted by the selection boundaries, otherwise the selection is just the whole image. Tried that with GIMP and Paint.NET, doesn't work like you describe it. I placed the same picture in 2 layers and did the mode & wand stuff, still random pixels get selected, not whole image. Anyways, this topic is about AAD, not image editing. I did put in a change a while back, though (at your request, if I remember right), that if you have it set to automatically download new scripts, it doesn't set the "restart required" flag after doing so. I don't remember that. Anyways, two restarts it is then if I get both new & updated scripts available in the future. You don't have permission to access /Music/b6/b3/d3/mzi.cyomhscs.tif on this server. I then immediately tried "metallica / load" search in AAD and iTunes API & iTunes Google worked just fine. ~10 minutes later, while writing this post, I'm able to download that tif image. Just reporting this anomaly. P.S. That Anibal Troilo guy in the cover totally looks like Ricky Gervais. i just tried the robbie williams search on discogs only and it was fine (10 results). Tried it too, 15 results for me. I don't know if it's been addressed, mostly because I cant figure out how to sure this particular post. 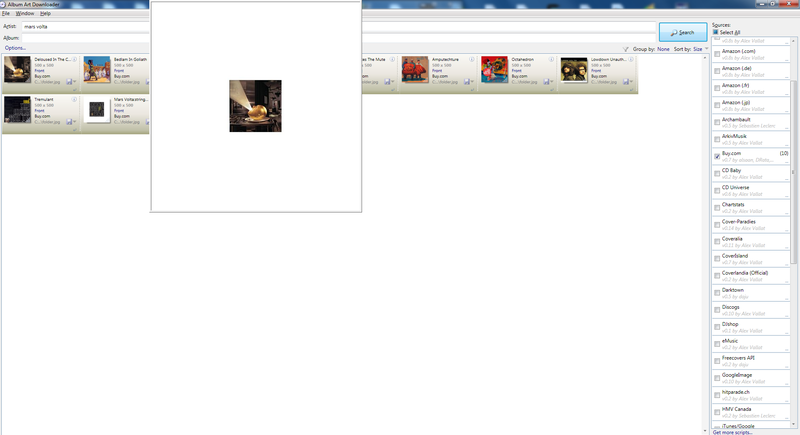 It seems when I auto download, it will find album art from album's it designated as "Not Found", and then stick it in other album's folders. Is this a common problem? Weird, but I don't think it's anything to do with the script. If .tif images stop working permanently then I'll change the script not to bother with them, but if it's only a temporary fault it's not worth changing anything. And yes, he does look a lot like Gervais! I've never heard it reported before. Could you try right clicking on one of the column headers in the foobar browser, and checking the "Folder" entry. That will give you a column which shows which folder it thinks each album is in, and it should be into that folder that it saves images for each album. This solved itself when I started using discogs for searching. Before I was only using Last.fm covers, which works when i go one by one, but somehow does this odd misplacing when i autodownload. Weird, but I don't think it's anything to do with the script. If .tif images stop working permanently then I'll change the script not to bother with them, but if it's only a temporary fault it's not worth changing anything. Nothing to do with the script, only the server. I just reported it in case some other user reports something wrong with the iTunes script.. might save some time bughunting. That's all.. just a "good to know" thing. is it just me (again), or did discogs script stopped working again? It's working fine for me right now... Is it a specific search that's not working? I've modified the script so that it detects this unwanted whitespace and trims it. Unfortunately now it is necessary to download the full size images every time, so I've also added threading to improve responsiveness somewhat. Thanks, alsaan. It does mean that the buy.com images are now pretty tiny, most thumbnails are bigger than they are! Do you think it is even worth keeping the script any more? If we are going to keep the script, I'm not entirely convinced by removing thumbnails support from it. There is already the facility in AAD to specify (even on a per-script basis) that only full-sized images should be downloaded, so it seems to me that leaving thumbnails in can only be a benefit. The downloading and cropping of the image can be done when (and if) a full size image is requested. The threading can then be left to AAD (which allocates one thread per script, and a separate thread for downloading full sized images). The ones I tried were all tiny images with huge white borders, but I could have just been unlucky. Anyway, yes, if the size can't be determined without downloading the full sized image, specify -1. There's an option in AAD specifically to download full size images only when the size is unknown which takes advantage of this. edit: removed paragraph of stupidity. Excellent, thank you very much. I've uploaded it to sourceforge and published it through the online updates system. The direct download link is: buy-com.boo. That looks like a problem I had some pages back. For me the problem appeared to be in Windows XP's environment variables. If you go to Control panel --> System --> Advanced --> Environment variables you'll see "Path" under system variables. Double click on it and check the line for anything put there by 3rd party programs. Delete those parts and try again. Thanks for the response and I deleted the system variable for path.